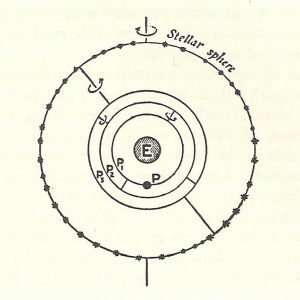 In this episode we do our best to bridge the gap between Episode 10, Prayer to the Gods of Night, where we looked at the long and complex development of arithmeticised astronomy in Mesopotamia, and Hellenistic Greek astronomy, which, starting from the Mediterranean heritage of this near eastern scientific work, took off in new directions and changed the face of astronomy forever. To get from Babylon to Ptolemy, the great late-antique synthesiser whose works would become the final monument of the Greek astronomical project, you need to pass through classical Athens, where you meet Plato, Eudoxus, and Aristotle. But on the way there you might as well stop and have a quick look at the Presocratics and their cosmological theories, and particularly at the astronomical speculations of the Pythagorean school, which seem to represent an amazing lost opportunity. We say ‘lost opportunity’, because at least some of the Pythagoreans were thinking in terms of an earth that moved along with the other planets, one which turned on its axis, and so on. But the cosmos which ended up winning the debate and becoming the standard scientific model from antiquity until the early modern period was the geocentric model developed by, among others, Plato, Eudoxus, and Aristotle. It was a refined and sifted version of this model which Ptolemy would bequeath to the middle ages. The west, and western esotericism, was, for the majority of its history, living on an immobile earth at the centre of a rather small universe made up of nested, concentric spheres. Questions arise from this model of the cosmos, such as: What’s outside the spheres, and how can I get there? What are the spheres made of? How do the spheres influence us? These are questions which we find played out in the history both of occult sciences like astrology and alchemy, and of western religious movements from the Hellenistic period onward. Adamson, Peter: as mentioned in this episode, Peter Adamson’s History of Philosophy Without Any Gaps podcast, of which we are big fans here at the SHWEP, takes astrology seriously in discussing ideas about fate, free-will, and related ideas in the history of western thought. Aëtius 2.1.1: Pythagoras first to call the world a ‘cosmos’. Quoting Aëtius is a little bit complex, as this wikipedia article explains. Aristotle: on Philolaos’ system, and the importance of number ten: Metaphysics 986a (he mentions ‘the Pythagoreans’, not Philolaos by name). The sun’s double motion along the ecliptic the cause of generation and corruption in the lower world: De gen. et corr. 2 10-11. The sun acting as celestial salad-whisk keeping the four elements mixed: De caelo 2.3, 286b1-9. The moon responsible for the timing of menstrual cycles: De gen. an. 2.4., 738a18 ff. 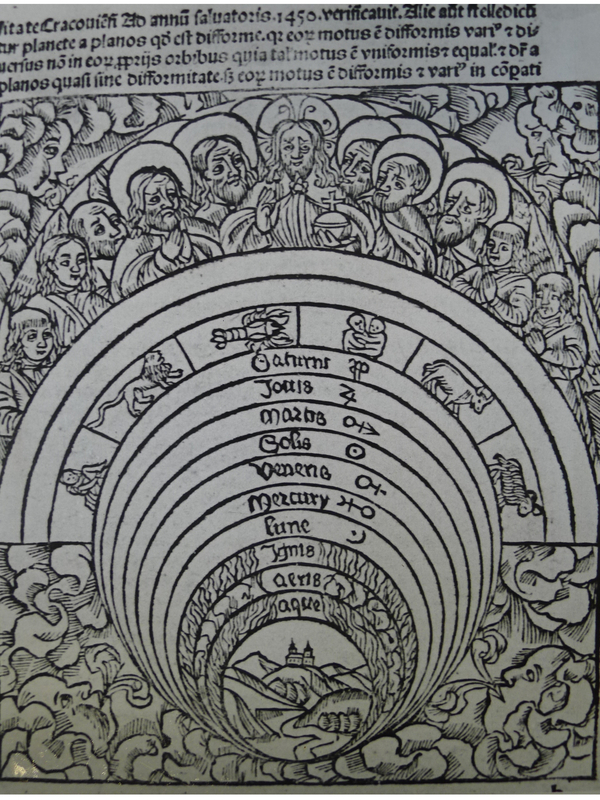 Celestial motions ultimate source of all motion in the sublunary world: De cælo I.9, 279a28-30; cf. Meteor. 1.2, 339a21-24. Hypsicles of Alexandria was a second-century astronomer-mathematician who wrote the Anaphorikos (‘On Ascensions’ or ‘Risings’), which contains our earliest Greek reference to the zodiac. It also features the first appearance of the 360-degree division of the circle, which goes back to Babylonian mathematics, with its sixty-based numerical system. Plato perhaps does think the earth rotates on the cosmic axis, depending on how one interprets Tim. 40 b10-c3: γῆν δὲ τροφὸν μὲν ἡμετέραν, ἰλλομένην δὲ τὴν περὶ τὸν διὰ παντὸς πόλον τεταμένον, φύλακα καὶ δημιουργὸν νυκτός τε καὶ ἡμέρας ἐμηχανήσατο, πρώτην καὶ πρεσβυτάτην θεῶν ὅσοι ἐντὸς οὐρανοῦ γεγόνασιν. Bowen, A. and Goldstein, B. (1988). ‘Meton of Athens and Astronomy in the Late Fifth Century BC’. In: Leichty, E.; de J. Ellis, M. & Gerardi, P. (Ed. ), A Scientific Humanist: Studies in Memory of Abraham Sachs, The Samuel Noah Kramer Fund. Cohen, M. and Drabkin, I., Ed. 1958. A Source Book in Greek Science. Harvard University Press, Cambridge, MA. Generally very useful. Elders, L., 1966. Aristotle’s Cosmology. A Commentary on De Caelo. Van Gorkum, Assen. Gomperz, T. (1901). ‘The Development of the Pythagorean Doctrine’. In: Laurie Magnus, trans. Greek Thinkers, London. This essay gives a plausible reconstruction of Philolaus’ cosmic theory which I like. Hoskin, M. (Ed. ), 1999. The Cambridge Concise History of Astronomy. Cambridge University Press, Cambridge. Pp. 18-47 give a great introduction to the period we’re talking about here, and cover a lot of the stuff we skip over in an accessible way. Huffman, C., 1993. Philolaus of Croton: Pythagorean and Presocratic. Cambridge University Press, Cambridge. Steele, J. M. (Ed. ), 2016. 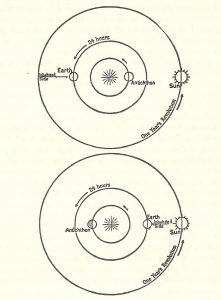 The Circulation of Astronomical Knowledge in the Ancient World. Brill, Leiden/Boston, MA. A serious collection of essays for those fascinated by how we can reconstruct the lines of scientific communication between different ancient cultures. Wilberding, J. (2005). ‘Creeping Spatiality: The Location of Nous in Plotinus’ Universe’, Phronesis 50 : 315-334. This article gives a great explanation of how Aristotle thinks god can be both located outside the spheres and not present in any space at all. Wright, M., 1995. Cosmology in Antiquity. Routledge, London/New York, NY, esp. caps. 8 and 9. Diagram from Thos. 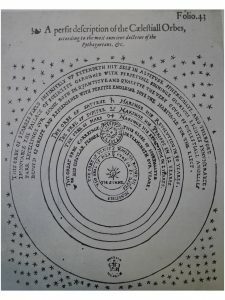 Digges, A Perfit Description of the Coelestiall Orbes According to the most Aunciente Doctrines of the Pythagoreans, Lately Reviv’d by Copernicus and by Geometricall Demonstrations Approved, 1546. P. 236.